Once the basics are understood, Foxall shows the reader how to apply this knowledge to real-world Windows programming tasks using C#. Each chapter contains exercises that reinforce the lessons learned in each chapter. 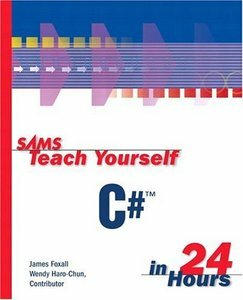 Tips, Notes, and Cautions provide additional advice from the authors on how to get up to speed and programming quickly with C#. Sidebars provide the more experienced reader with tips that will ease their migration from Visual Basic 6 and Visual C++ to C#. James Foxall is Vice President of Development and Support for Tigerpaw Software, Inc. (tigerpawsoftware) an Omaha, Nebraska, Microsoft Certified Partner specializing in commercial database applications. James manages a commercial suite of programs designed to automate contact management, marketing, service and repair, proposal generation, and inventory control and purchasing. James's experience in creating certifie Office-compatible software has made him an authority on application interface and behavior standards of applications for the Microsoft Windows and Microsoft Office environments. James has personally written more than 150,000 lines of commercial production code, both in single programmer and multiple programmer environments.